l Magna was crawling with UFO activity on the 4th ofJune 2003. My wife and I was doing a little sky watching from the driveway of our Magna home. In just a couple of hours we seen and video taped 10 moving objects. Most of the objects was single moving objects travelling from North to South and South to North. One of the sightings was a pair of object's moving to the South, one behind the other. At arms length the object was 1.5" to 2" apart. One NOT caught on tape was ( My wife calls a grey shooting star.) This Grey shooting star was not bright in the sky but a dimly lit shooting object. with no visible tail like a shooting star. This object was in comparison to the other object twice as close. This could be so close as 1 mile above Magna. UUFOH Note: Chris Rock has witnessed andvideo taped many UFO's in Utah. Location of sighting: East of Magna, Between 3100 So, and 3500 So, and 7200 West and 5600 West. Description of object /s : Very Bright Light. gone. I raced into the house to grab the camcorder just before it went out, but I didn't get anything on tape. during the time I could see it the object did not move in the sky. Height / Altitude of Object: b 500 to 1000 feet. Distance of Object from your Position: 1 to 2 miles. Estimated Size of Object: unknown. Seen before? Description of past experience: :Yes. With MUFON investigator Guy R.July 2001 at the Great Salt like about 200 to 300 feet over our heads. UUFOH Note: Also repoted to: UFO Reporting Center. Witness has had numerous sightings in and around the Salt Lake area. has many UFO's on video. Occurred : 06/02/03 Time of Sighting:11:58 p.m. Description of object /s : It was a triangular shape. The three points were the areas that were the brightest. it was semi-circular shaped on the sides of the overall pyramid. It was quite small, maybe the size of a bike. The glowing was bluish white. Height / Altitude of Object: 100 yards off the ground. Distance of Object from your Position: 50 feet straight forward then 100 yds up. Estimated Size of Object: The size of a bike. Any Animal disturbance? : Lots of howling from the local dogs. Suffered - Decription of effects: I was blind for about 1 hour. Occurred : 6/05/03 June 5 or 6 -Time of Sighting: 11:00p.m. Description of object /s : It was kind of egg shaped not round but not oval either. whitish color. I could not see 'any' wings. Sighting Event Details: I wasn't sure if I sould have reported it as I don't know what it was. It could have been a regular object as it was too high up, to know for sure. I ran into the house to get my binoculars but it was gone in 15 seconds after I got back outside. There was no sound or contrails at all and it was going very slowly. but it was very high up in the sky. It went in a straight direction. It did 'not' look like it had wings. It went from the North to South over our red hills near Cedar City, Utah. There was a TV repeator near it but I don't think it cared about that. It was still light outside like day light. Estimated Size of Object: About the size of a regular airplane except egg shaped. -- I had an interesting experience yesterday on June 29, 2003, between 5 and 6 PM. We were having a family gathering in our backyard in Roy, Utah and my son-in-law pointed out an object in the sky. It was pretty high, I assume because, with the naked eye, it was about the size of a pencil eraser. The rest of the family searched the sky and spotted the object. Watching it, it looked like it was heading toward the ground, because it looked like it was getting larger. Then it stopped and hung there for about five minutes. Then the object slowly began moving north and suddenly divided in two. I spotted the two objects. The second just accelerated really fast and flew off to the south-southwest and disappeared. We continued watching the first object, when suddenly the second returned with equal velocity catching up to the first. The first still traveling slowly north-northeast. The second object then changed direction and flew off to the south at a high rate of speed then disappeared. I looked back to the first object and watched it for a few more minutes then it, too, disappeared. The objects appeared round or oval, I thought they may have had wings but I cannot be sure. It was either white or silver-reflecting-sunlight. The display lasted over a half-hour. There were three of us watching the whole time, and four others watched for a few minutes. Sighting Event Details: I was watching the stars frome my porch on 7-22-03 in Manila Utah I spend alot of time up there and i watch the stars at night there are no lights around so its good and dark I know the star pattern but 7-22-03 there was somthing different that night in lower rite hand side of the sky there was a light that looked mars red-amber ball of light but it would slowly go out and come bacb on some times out for 5 or ten min but did not move it did this for 2hr then went out and did not come back on. Height / Altitude of Object: ? Description of object /s : The sighting was a thin, black, cylinder. It might have been a disc, but due to the angle we were at, it appeared to be a cylinder. during the entire experience. We finally turned around and headed home, with the sun just beginning to set. Phenomenon visible for how long? Twenty minutes to half an hour. Distance of Object from your Position: Possibly a mile. Direction of Object: Gliding north and south in a back and forth motion. It finally headed south at a very fast speed and we lost track of it. Estimated Size of Object: Unknown, but at least the size of an automobile. # of Witnesss: At least 5. 4 main viewers and countless curious people in the parking lot. Seen before? Description of past experience: Yes, I have experience paranormal activity very often in my life. Suffered - Decription of effects: My body has always had a natural electromagnetic pulse field around it that affects electronic devices randomly. Lampposts go out, lights flicker, machines malfunction, etc. Description of object /s : It first looked like a bird but why would a bird have lights? it was a half oval shape with very 'dim' orange lights around the front. Estimated Size of Object: To far off to determine size or shape. UUFOH Note: Thanks to Pete for sharing his sighting with us. UUFOH Note: Left contact info -Date is unusual, Report sent on 9/22/03 and sighting date is 9/23/03 a prediction? Description of object /s : Weird fast movin lites in the sky, I think theirs a secret base in the hills west of my trailer park between here and Calente. Estimated Size of Object: Big. It was beautiful!!! It slipped through the sky like a dream with no sound at all very easily as if there was no air. You had to be already looking at the sky to see it or it would easily have been missed, it first looked like a bird but why that high and birds have no lights that I know of. it was a half oval shape going in the direction the lights were shining, I'd say it had about 8 or 10 very, very 'dim' orange lights around the front, the direction it was going. and it was going very fast! as if there were no air at all. NOT like one of our clunky old airplanes or jets. It seemd to just glide effortlessly with no sound straight through the atmosphere. It was beautiful!!! I first went out to water my lawn since we have to do it before the sun rises and I always look up in the sky. If I hadn't, I surely would have missed it. Again it was just like a dream or something the way if glided effortlessly so fast. I looked all over but never seen another one. Again No, I didn't have my binocculars but if I had, I probably could not have sighted it in, because of it's extremely fast speed it was going. Height / Altitude of Object: Just below the clouds, I could see it cross the sky. Estimated Size of Object: It looked like a half quarter at arms length, size.It's hard to guess, It was quite large at that altitude. Hear Sound? NO sounds at all, no dogs either, nothing at all. Seen before? Description of past experience: Yes. 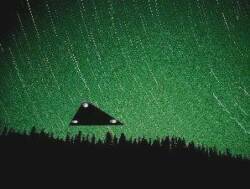 I once seen one going from the south to the north in the Western sky but that one was very large and close to the ground and seemed like it was a triangle with straight lights on both sides. and one wing's lights of this one, has entirely different lights than the other wing had. similar but not exactly the same as the one I seen this morning. And was accompanied by a real loud jet airplane over my house going from the south west to the north east. it must have been about 4 or 5 years ago. the one I seen this morning was more rounded or oval at the front. UUFOH Note: Alan is a member of UUFOH and has a keen eye. He has had numerous sightings. wave of water or pane of glass would. It faded away sort of eerily.as it passed by a tree. I could not tell if it was one large object with three lights or three smaller objects/ lights in formation. one leading two following. Which seemed unusual, it did not pass in front of any visible stars for me to see if it blocked any of them out. I watched for 15 or so minutes to see if it would reappear, it never did. Distance of Object from your Position: Cliff face was 400 yards away and 200- 300 ft high.to the west. object was approx. at a 30 degree angle when first seen.traveling east. Seen before? Description of past experience: yes but not this close. In 99 seen a triangle formation with point in the back or two leading, one following. at high attitude. witnessed by 6 or 7 other campers. Video attempts failed. Photographic Evidence? ; Attempted to photograph it with my Canon EOS Elan II with 800 sp film. attempts failed to show any movement or even the lights in formation. Description of object /s : I did not witness first hand. I was told of the incident by several employees of the cement plant near Croydon, UT. A very colorful light was seen for about 1 hour hovering, completely stationary, very high in the sky. One witness described it as "a star burning up", however it was stationary. 3-5 employees spent about 1 hour watching from a high tower in the plant. Was seen over the hills/mountains between Lost Creek and Chalk Creek. Changed colors often, yellow, blue, green, purple. Very obvious. I did not hear details about how it appeared and finally went away. One person described it like a party light, or a stop light changing lights very rapidly, but with many different colors. However, was not so rapid as a strobe light. Sighting Event Details: Please see description above. Was definitely not an airplane or helicopter. Appeared to be very, very high up. No noise. No movement, only changing light colors. Observed from cement plant near Croydon, between Henefer and Morgan, just off highway 84. Seen before? Description of past experience: when the story was told to another employee who did not witness the event, he recounted a story how 2 days before, while hanging out in Ogden about 1:00 AM, a friend stopped by in a somewhat panicky state, explaining that she had just seen a UFO. She apparently described it as a light ball, which while rotating would change colors as it rotated in various directions. Many colors seen. He didn't think anything of this story until he heard from other fellow employees of what happened as described above. * ----, Thanks for your reply. Do to the stationary position, all night long} no shape detail or manuverability. Also when looking at some certain stars with binocs they will exhibit those multiple colors..Gases} . Unfortunately, it would be safe to say it was more than likely a star, very easy to misidentify. However, due to the fact of possibility it could of been something else UFO ETC. Description of object /s : When seen through an 8" dobsonian telescope, the object was made up of 6-10 lights. When witnessed with the naked eye, it looked like one large bright orange light. Sighting Event Details: My friend and I were holding an astronomy group for some boys that we work with. As we were scanning the skies for something worth while to point our 8" and 10" dobsonian telescopes at, my friend noticed an extremely bright light in the western horizon. We knew it wasn't a planet, as mars was to the south and east of us at the time. At first, we thought it might be an aircraft approaching us and we were just seeing the landing lights. But, the light seemed to hang in the sky south of West Mountain(western side of Utah Lake), so we knew we weren't seeing the various transmission towers on the mountain. The object appeared to hang near or above the area where the town of Eureka is located. My friend trained his 8" telescope on the object, and what we saw gave us chills. When viewed through the eyepiece, the object appeared to have 6-10 orange lights. The lights appeared to be arranged in an ellipse. The excitement built between us, and we kept watching the object for a few minutes longer. After about five or six minutes, the object proceeded north above the western most mountains of Utah valley. The object moved slowly, and maintained its intensity. After about fifteen minutes total, the object grew dim, as if it were heading northwest from us, and then disappeared from sight entirely. Description of object /s : Two balls, rotated then two more appeared. Sighting Event Details: I was on my roof at about 5:30am on Sunday, October 5th, looking for what else? A UFO. I was about to head in to go to bed when I saw a red, small light. I pretty much disregarded it right then and there as a plane, cause after about eight years of looking and getting only 1 or 2 "UFO's", you can pretty much tell what is a plane and whats not. But I did another quick glance and noticed that there was another red dot about 2 inches behind it. I remember thinking, "Wow. That plane is flying really close to that other one..." but I noticed that they were flying inunison. Then they both stopped, hovered in the same spot then started moving, south away from me and a very slow rate of speed. After about two minutes of south-ward travel the two lights went vertical, then 2 more lights apeared to the left and right of the previous two, making a lowercase 't' or cross. The four of them togeather spun slowly counter clock-wise, once, then vanished. All in all it only lasted about 10 minutes. Sighting Event Details: See: Description of object/s part of report. Direction of Object: to the east of Dugway testing range and between Dugway chemical depot and Rush Valley. Estimated Size of Object: Possibly 30 ft. wide but could not tell because it was lit up very bright. Suffered Description of effects:I made sure as I was driving down and back from Dugway to record my time and mileage from start to when I arrived home. the was no missing time. I began (10:50 PM) at 5600 west I-80 to Dugway, then over the mountains into rushvalley onto toole to I-80/5600 W. to home. (1:30 am) in total: 138 miles. Description of object /s : Saw a flaming piece of the meteorite fall yesterday even this far east of S.L.C. Last week saw a large round whitish silver object for about 35 seconds then it disappeared fast, on hwy 208. about 1:00 p.m. Sighting Event Details: I look at the sky a lot it just happened to be where I looked. Height / Altitude of Object: about the same as an airplane perhaps lower. Estimated Size of Object: It was a distance of about 5 miles Looked to be large. UUFOH Note: Left contact information, Witness may have Picture? Location of sighting: West of I-15 at Santaquin. Appeared to be over the Genola area. Description of object /s : A yellow and orange fan-shape light that appeared and disappeared in several locations. The light appeared to contain multiple intertwining beams that fanned out from a central point. We are not certain the object was the same each time it appeared. Sighting Event Details: We were travelling southbound past Santaquin on I-15, when my wife said "what is that?" and pointed at the western sky. I could only catch brief glimpses of the object as it kept disappearing and reappearing as I drove. I commented this object was similar to the one I had observed on the previous evening in Oak City. Phenomenon visible for how long? We observed it for about 2 minutes. Distance of Object from your Position: Probably not more than 10 miles, but uncertain. Estimated Size of Object: Very large fan shape. Noticed Object/s: Other - It remained in the western sky over the Genola area. Seen before? Description of past experience: I had observed a similar object the previous evening. However, the shape and behavior were different. I have already submitted a report for that sighting. UUFOH Note: Left contact information Follow up performed: #1 by UUFOH - He let us know how very glad he was, to know that we take these sightings very serious and that both himself and his families privacy was respected. He had nothing further to add, other than he was curious as to the color of the lights. I did share with him that the Yellow/Orange running lights used on Stealth Aircraft cannot be detected by infra-red. Description of object /s : Object was a stationary, orange-colored light in the sky. It was visible for several seconds and faded. Just as the object was about to disappear, a beam would project from it for a short distance and a new stationary light would appear at the end of the beam. This process repeated itself several times over the course of about three minutes. Sighting Event Details: I was driving west into Oak City from the canyon when I observed the object. I first saw the light and concluded it was an airplane with landing lights until it faded and shot the first beam. It then had my full attention. I am not certain if the object travelled along the beam to a new location, or if another object appeared at the new location. The pattern of movement seemed random, and at times the object would pass behind or in front of a small group of clouds. The event ended abruptly after about three minutes, and I returned home. The area of sky where the object was observed was in the vicinity of the Intermountain Power Plant. Height / Altitude of Object: uncertain, but fairly high up. Seen before? Description of past experience: About four years ago I observed a similar object in roughly the same area, but slightly farther south. It travelled in and around some light, scattered clouds at that time, but travelled in more or less a straight path. Description of object /s : Two columns of light, well more like three lights that made up one column, two columns per unidentified flying object. They danced in the sky. Pattern was observed. Sighting Event Details: pictures will suffice much better than words. We were watching a movie. I saw it fly by out the window. six yellow light in two collumns. It flew one way and then anouther the other way. They seemed to dance in the sky. We ran outside, waiting for another glimpse but it never came. Height / Altitude of Object: we were on the ground they were much higher than the overpass that was right next to the house. Any Animal disturbance? :none, at the time, but dogs were barking prior to the time I saw the object. Description of object /s : two incredibly brilliant shining orange orbs in all their splendor, mystique & glory shining intensely , but not illuminating the desert floor directly overhead. Sudenly they exploded into a million pieces, like a surreal fireworks diplay , but stayed suspended for several seconds before seemingly disintegrating. it was so spectacular , you just intuitively knew you were witnessing something of a very exoitic nature and origin. Also no apparent noise or boom with explosion, at least none was detected while driving with window up. Being so close to this event-display, one could not help but think, was I suppose to see this? Apparently so because I did. Saw these same kind of Orbs in Sept 2000 from much greater distance, this time on the Hill air Force Base test range, much furthur north on the western shore of the Great Salt Lake, a total of 22 lights going off & on as many as 4 at one particular time with two other witnesses present. an interesting observation indeed, also one of the orbs split in two and formed another orb, almost like you can visulize cell division under a microscope. 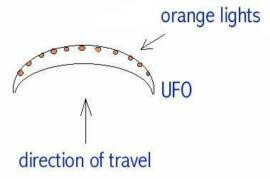 Description of object /s : it was a cigare shape ufo and it looked like it hade lights on the side of the ufo . Sighting Event Details: I was going for a walk saturday night and i was just behind the new lds instiute and i looked up towards ceu and i seen a silver cigare shaped ufo and i took off at a dead run towards ceu to see what was going on with the ufo and when i got to the center of the ceu campus the ufo shot off towards the skate park and then i followed it to the skate park then it came to a suddent stop over the skate park and then it changed directions and started towards me then it stoped right above me i was looking stright up then it was just hovering there i was frozed i couldnt move one bit and then the ufo took off towards green river then when it got over smiths it changed course and was heading in a stright line between green river and hunington and then after it was outta sight i could move agian so i took off at a dead run back home and i was kinda shaken up becuase i never had ufo encounter up close and personal becuase the ufo was hovering right over me and thats what really scared me . UUFOH Note: Left Contact Info. witness has reported numerous sightings in the area. Description of object /s : Solid formation, changing shape, size and color. Sighting Event Details: I was traveling along main street in Centerville when I noticed an object moving across the sky. As quickly as I noticed it, it changed its size and its color from a dark blue to an almost blinding yellowish-orange and disappered. Phenomenon visible for how long? 3-4 sec. Description of object/s Sighting Event Details: Hello, My name is Jonathan Lindberg, and I reported the astronomy group UFO sighting on 10/13/03. Noticed Object/s: Rotate, - Object was seen emitting a light or beam towards the ground or other object, - Formation Pattern was observed.